I completely fail to understand the basis on which Nicola Sturgeon believes the SNP can be so powerful at Westminster that they’ll be able to demand full fiscal autonomy, an end to austerity, no more Trident and so on as the price for supporting a “progressive alliance” (her phrase). The numbers simply don’t add up. 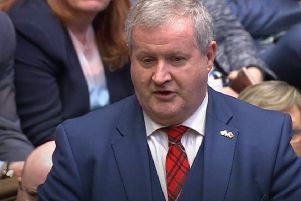 Overall there are 650 MPs at Westminster, with Scotland returning 59 or just over 9 per cent and, even if the SNP won every single seat in Scotland, they could not hold a larger share because they are not standing outwith Scotland. What the polls suggest this time, and what the SNP anticipates, is that the SNP will take a large number of the Labour seats. But this process will not increase the overall size of the “progressive alliance”; it will merely change the internal membership and, even if half the Lib Dem seats fall to the SNP, the progressive alliance will still only increase its total size by a tiny amount. However, what will be an outcome of all this is a serious weakening of the Labour Party’s position vis a vis the Tories at the UK level. In 2010 the Tories won 302 seats to Labour’s 256. While the Scottish “progressive alliance” might emerge from the general election much the same size, the Labour Party will be diminished by every seat it loses to the SNP thereby increasing the gap between the two major parties and strengthening the Tory’s claim to form the next administration whether in coalition or as a minority government – and the SNP know how well the latter can work. Indeed, might we expect a mirror image of their minority administration, with the SNP offering informal support to a Tory minority administration? THE two Scottish debates were very revealing. Rather than Nicola Sturgeon addressing her usual special interest groups promising them Utopia she was subjected to searching questions by the other “leaders” and the audience about the Scottish economy and her government’s record. Her response was far from convincing. For example, she claimed the oil revenues would be lower by only £3 billion by 2020 but other industries would be £15bn higher by the same year. However, what she didn’t mention is that government spending would have also increased in line with the growth of the economy during the same period. Also, when pressed further on the economy and in particular the impact of the SNP demanding full fiscal autonomy (FFA), which would mean losing the Barnett formula (£7bn) in exchange for volatile oil revenues (£600m forecast), Sturgeon pointed to Norway and its £500bn oil fund built up through revenues which had been “stewarded and not squandered”. Really? What she failed to mention is that Scotland spends £1,300 more per capita than England each year in benefits which includes free university tuition, free prescription charges, free assistance to the elderly, free eye tests, free tolls etc. It was the Scottish Government that decided to spend the equivalent of the oil revenues in this manner rather than save for an oil fund. It therefore does not make sense for Mrs Sturgeon to claim the oil revenues were “squandered” unless she disowns and scraps the benefits mentioned above. If not, she should retract her statement and explain where the funding will come from in the future if the SNP get their demands for FFA and lose the Barnett formula. You can’t have it both ways. I was pleased to receive from the Westminster Government a copy of the new booklet “Scotland’s Changing” detailing the powers the Scottish Government has. I’m sending mine to Nicola Sturgeon – in the vain hope she’ll be reminded about the array of powers Holyrood already has and she isn’t using. I can only imagine she’s too busy clamouring for more powers to bother about those she already has.